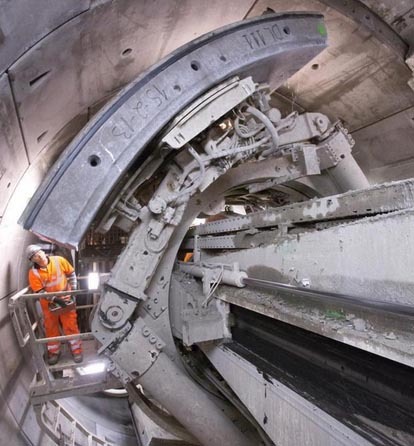 Bechtel Ltd is working on Europe's largest construction project, the Elizabeth Line, which is the first full new ungrounded rail line built for London's Tube in 30 years. Called the Crossrail,( until it is renamed the Elizabeth Line upon competition) the project will bring eight new subsurface stations and 26 miles of tunnels under the city, eventually carrying riders to 40 London Underground stations. According to 3ders.org, Crossrail is also the first commercial building project to use 3D printing. While demonstration buildings have been 3D printed in Dubai and China, those structures are still conceptual. The issue, says Bill Baker, an engineer for the Burj Khalifa in Dubai, is that printed concrete is produced layer by layer, then fused together to create a thicker panel. However, weakness develops between those layers, making the panels ultimately unsuitable for real buildings. “These things can peel apart,” Baker says. To solve the problem, Bechtel is using a system supplied by FreeFab which uses a specialized wax to print extremely precise molds in which to cast concrete (Above, image by FreeFAB). By 3D printing highly precise wax molds rather than 3D printing with concrete material itself, the FreeFAB Wax process allows builders to achieve complex shapes that are lightweight and incredibly strong without dealing with the peeling issues encountered when printing directly with concrete. FreeFAB, based in Australia, says its wax technology makes casting concrete for heavy duty applications such as the Crossrail's tunnel 5.2ft wall panels, creates much less waste than traditional concrete casting methods. Current molds made from wood or polystyrene will produce only one concrete shape, after which the mold is unusable again. The FreeFab Wax mold also creates just one concrete shape but after the mold is broken, the wax remains can be remelted and used to 3D print an entirely new mold. The company says up to 90 percent of the used wax mold can be recovered, resulting in dramatically less waste, less energy used to make each mold, and reduced material consumption. Since the Crossrail project will require 250,000 of the 6,614-pound concrete panels, FreeFAB's wax mold process should greatly reduce the cost of waste materials. Plans are for the Elizabeth line to open in December 2019.